Some of the grim details about state-government-level mismanagement in Vermont of the massive Jay Peak EB-5 scandal have emerged in further coverage of this long-running story by the alternative news site VT Digger. 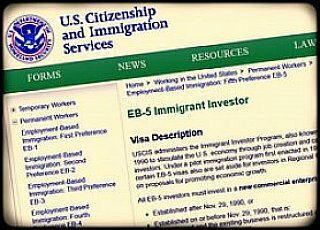 The federal immigrant investor (EB-5) program provides a family-sized set of green cards to aliens who pony up at least half a million dollars to invest in a Department of Homeland Security approved, but not guaranteed, investment, usually in real estate. Most state governments have nothing to do with the program — to their relief — but Vermont, South Dakota, and briefly, Michigan, have played middleman roles, leading to huge scandals in the first two states. These three states created DHS-approved regional centers, accepted investments from would-be immigrants, and passed the money along to States-side developers. All three are now closed. The overall story is that the federal agency in charge, USCIS, let questionable players handle the aliens' money with little oversight, and in Vermont and South Dakota, the state agencies were equally negligent, to stay the least. As both VTDigger and CIS (see here and here) have reported over the years, more than $50 million in investor funds went missing in a series of frauds masterminded by Florida-based Ariel Quiros and locally managed by his Vermont-based partner, Bill Stenger. A larger total, of "mismanaged" if not lost funds, is $200 million. Some of the money was involved in an (operating) ski resort, Jay Peak, some in a never-built, Korea-related human organs laboratory, AnC Bio, and some in various other projects. The former Director of the state's EB-5 Regional Center, Brent Raymond. The suit was brought on behalf of some of the foreign investors who lost money in the program. They are represented by attorney Russell Barr. Stenger had a close relationship with [U.S. Sen. Patrick] Leahy [D-Vt.] and Quiros was close with Shumlin. Both politicians received large campaign contributions from Jay Peak. Barr secured a long deposition from Raymond, in which the latter said that he was blocked again and again as he sought more information, such as regular quarterly financial reports, from Quiros and Stenger. He said that he repeatedly sought audits of the EB-5 funds but was told by his superiors to back off. [Brent] Raymond had received a certified letter from an attorney in South Korea that didn't adequately address his concerns about whether Alex Choi was Ariel Quiros' brother-in-law. Choi was a long-time business partner of Quiros and the owner of AnC Bio Korea. He was prosecuted by the [South] Korean government for defrauding investors in 2012 — the same year an identical project was brought to Vermont and approved by Miller. The question about the exact nature of his relationship with Quiros is unresolved. Raymond asked MacLean if he could follow up "and was told no. Lay off." Questions about Quiros' family ties in relationship to AnC Vermont, MacLean told him were "off limits," Raymond said. He recalled that she [MacLean] said: "You don't speak to Bill Stenger that way." Stenger had immense political clout in Vermont — having testified in Congress about EB-5, traveled on a trade mission with Leahy to Ireland, and on multiple occasions being named Vermont Chamber of Commerce's "man of the year." Both Sens. Leahy and Grassley now agree that the program should be terminated. While what Brent Raymond said in his deposition fits neatly with many other accounts of what happened, some opposing lawyer is sure to ask him: "If things were that bad, for so long, why did you stay in the job for three years?" Perhaps he would answer, as some anonymous "senior officials" have said in the Trump administration, "I was just trying to prevent it from getting worse."